When I was young, like many girls my age, I wanted to be a veterinarian. We went through that stage of adoring kittens and puppies, so what better job was there than to be surrounded by them all the time? Soon my friends decided teachers or stewardesses would be more exciting careers. I was serious. I stayed focused and even had undergone specialized training that ensured I would be a Great Vet. 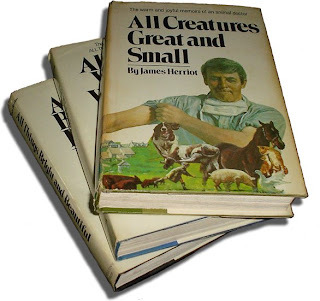 For you see, I had read the ENTIRE series of books "All Creatures Great and Small" by James Herriot. Undeterred that I didn't actually OWN any pets except for a few tropical fish and a small mouse, named appropriately, "Tiny", I was positive I wanted to dedicate my life's calling to the care and healing of animals. As I grew up, surprisingly that dream stayed with me, even until after I graduated high school when I found out a new Veterinary Assistant's course was starting up in our city. Joy! I wouldn't have to travel to the next province to train! It was surely meant to be. I placed my name on the two year wait list and took an evening course in chemistry just to make sure I met all the prerequisites. I was already taking Business Administration at the local college. I wonder what would have happened if I had chosen that path? Would I have become a Great Vet like James? Would I have saved the lives of countless animals? Would I have learned the proper technique to give medicine to my own cat without wasting half of it dribbling down my hand? I had unwittingly acheived my life's dream. Just think of all those animal's lives I have saved by NOT becoming a Great Vet. 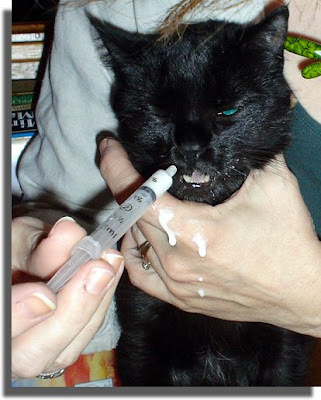 Giving medicine to a cat either by pill or syringe takes real talent and some luck! Both my husband and I had no luck with getting the medicine our cat Moe needed in to him to survive and the nice vet actually took him in to her home to get him eating on his own again and saved his life. I'm sure with practice, you would get better at this. When we tried, our cat wiggled out of our grasp and the medicine just squirted everywhere! We are fostering two abandoned kittens at the moment. They are cute to look at, but you quickly realize that what goes in one end, comes out the other and it isn't a controlled thing. So the reality is, half of being a vet in training is going to be waste product managment. Business school may have been a better option in the long run. Wahahaha! I like your sense of perspective. Next time my wife says I drink too much I can use "Nuh uh, I purposely did NOT become a bartender!" And then she'll look really confused and walk away. Situation diffused. That's one happy looking cat! You should caption it and submit it to icanhascheezburger. Silly hoomans. It's a good thing that there wasn't a feature to that medication you needed to be concerned about. You know, like staining the skin, for example. Or causing warts or something. Lotus07: Aw, fostering kittens? Good for you. Ha! About the waste product management! Very true. Ashley: Ha! I know! That face is hilarious... Heather took the pic while I administered... even though it looks like I am strangling her, I'm not. Just holding her head still. Poor girl. Twice a day for days of this. Iceel: Yikes! I was thinking if my skin looks better, I may just have discovered an anti-aging cream or something! Cats are notorious for NOT taking their medicine. They think we are torturing them. I dread one of mine getting sick. I just refuse to contemplate it. They will just have to magically get over it by themselves. Don't you love my ostrich attitude? I don't do this with the dog. He neatly takes his medicine wrapped in slices of luncheon meats. LOL ... trust me, if a cat doesn't want to take medicine they won't! Too funny. Ha ha. Love that Bruce Lee choke hold you have on the cat. Straight out of vet school for sure! I see you're practicing the "choke your cat until it dies so it's easier to give it the meds" approach. Works every time. I have the same problem...with my kids. My cat is much better at taking medicine then they are. Irene: I know! I have had to give pills to my dog, and simply wrapped them up in cheese. Not so easy with liquids for cats. Although, I do have to say, she is the easiest one to have this done; Dakotah is the most easy-going of our felines. Drowsey: I learned early on not to squirt it all in her mouth at once; poor girl. Now I do about four squirts. She doesn’t like it, but she doesn’t freak out at least. Janet: Aw, that’s sweet of you to say! I know I would have loved to treat animals, but I am sure all the sad cases would have broken my heart too. Lisa: Ha! Yeah, it certainly reminded me of trying to force my daughter to take liquid meds... you are right. I think the cat takes it better. That brought back some memories! I spent quite a few years working as an 'animal nurse' and yes - a lot of it is waste management. NOT the glamorous job young girls tend to think. You get bitten and scratched and trodden on, too! One time I got heat stroke from being out in the field with the vet doing tuberculin testing on a herd of cows. But I don't regret it a bit. If nothing else it's given me a good understanding of animals and how to get medicines to them. My favourite technique with a cat was to stand him on a wooden table (though not one you value) and take him by the scruff of the neck. You then bring the cat to the edge of the table so that his front feet dangle, then slide him back until he grips the edge firmly with his claws. This is an instinctive reaction and believe it or not, they're quite reluctant to let go, even to scratch your eyes out! You can then tip their head back and drop pills down their throat, or have someone grab the hind legs and inject them. Of course, this is for wild, uncooperative cats, but one of my own strays was like that. LOL! Jay: I have to admit you were the inspiration for this post... you reminded me about All Creatures Great and Small, and since we just had Dakotah at the vet, it all fell into place. Wow, your experiences sound both amazing and hard... it definitely isn't a glamourous job, is it? But a worthwhile one. Thank you for the hints on getting a cat medicated... I know I won't be the only one to benefit by this! Thanks so much!!! From the vets I've seen I think that medicine administration to cats is almost impossible.